There's just something cool about a light dangling from a ceiling with a cage wrapped around it. It's simple, rustic, unique, vintage-looking, and industrial all wrapped up in one. And I'm all about it. Is it just me or do you love the look too? Here are some as wall sconces. Love. And some in a kitchen. They really look delightful in any finish--black, oil rubbed bronze, silver or antique brass...love them all. I've been wanting some for a while now but they're so darn expensive. (Check out that Etsy shop up there--definitely the cheapest I've come across.) So wouldn't ya know, as I was perusing a local thrift store today, I spotted one:) Definitely wish there were two (to use in the boys' room as bedside lights), but I'll take what I can get. Mine is a plug-in one, which is a nice option to have if I use it by one of the beds, otherwise it can still be hardwired if I decide to use it as a pendant hanging from the ceiling. It's very similar to the RH one, don't ya think? 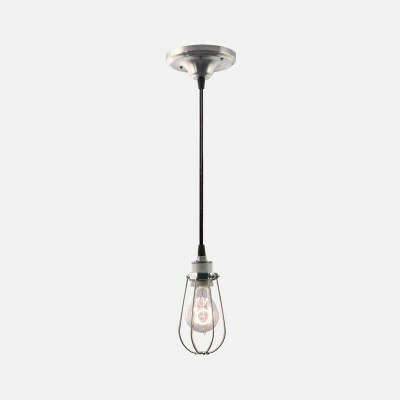 Just slightly different in price though; So are you a fan of these or do you think it's a joke to spend even $4 on something that's going to have an exposed light bulb hanging from it? (You definitely have to use the right kind of bulb though. Like the filament one on the left.) You know I'm totally a fan, but I'm curious--are you? Fan! I love those types of lights. What are your ideas for the finish? Not sure if I'll leave it as is or spray it dark, either oil rubbed bronze/black. So stay tuned! I think it's a great idea for a child's room....especially a boy. Seems very practical. Oh I love this and the idea of it in ORB or black. Great find!!! I can't wait to see the boys room when it is finished. Love these lights too! Great find! I think these are great for boys' rooms. At least the bulb is protected from the many things boys throw! There is a house I drive by on my way to/fom work and above their kitchen table they have a caged chandy type light. Very cool!